Hiking in the rugged, beautiful Sierra Nevada mountains is always a striking experience, but it's easy to forget that it's a work in progress, and not simply a sculpture for one to scramble over. 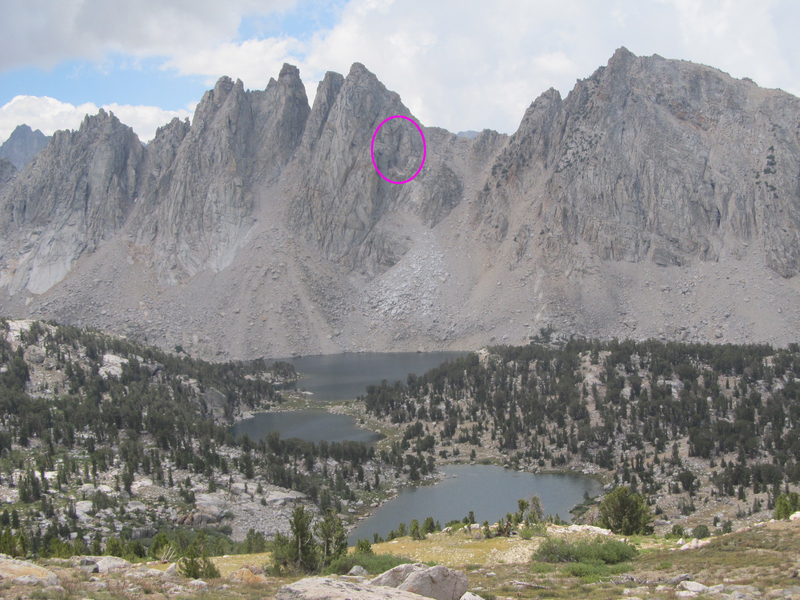 If you climb up Kearsarge Pass from Onion Valley, the first thing you see on the other side is the dramatic Kearsarge Pinnacles, with the inviting Kearsarge Lakes beneath it. 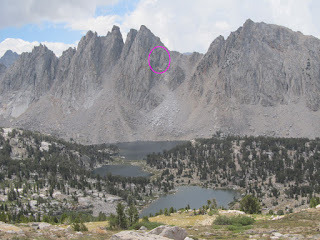 We wound up camping that night at the Kearsarge Lake in the bottom of the photo--the first one you come to. It was a peaceful evening. The next day on July 21st, we went out on a lengthy day hike to try to see Glen Pass, and we turned around in once we realized we were facing an approaching thunderstorm that drenched us with hail as we raced back to our comfy tent. After stashing things out of the rain as best as we could, we retreated to the tent to plan how we would dry stuff out the next day. The rain let up and all was quiet, and we fell asleep only to be startled out of that peace at approximately 11pm by a huge cracking and tumbling sound, joined by many more. It was like an army throwing concrete down a long slope. Crash, boom, thunk, boom, boom, thunk, crash, tumble, shudder. The larger, very loud, impacts shook the ground. My wife, Terri said something unprintable about the status of our safety, but I remembered that we were further away and we just held on for a very long 30-45 seconds. The next day, there was a suspiciously clean pile of stones above the lake closest to the Pinnacles and while it appears that the landslide didn't cross over to the area where people would have camped, given that it was plenty loud for those of us at the furthest lake, for those at the closest lakes, it was very likely a "We're gonna die." or "Come to Jesus." moment depending on the listener. While we were approaching the Lakes, we had one hiking party recommend the lake closest to the Pinnacles as "the best." It may be, but you many pay the price of either a heart attack or having to replace your underwear, if the geology gods decide it's time to rearrange.